It is very important for Japan to strengthen the basis of its exploration technologies, in order to maintain its position as a leading country in international exploration and for its own space exploration endeavors to the Moon and Mars. We are conducting researchs to promote space exploration missions in the near future by exploiting advanced Japanese technologies. 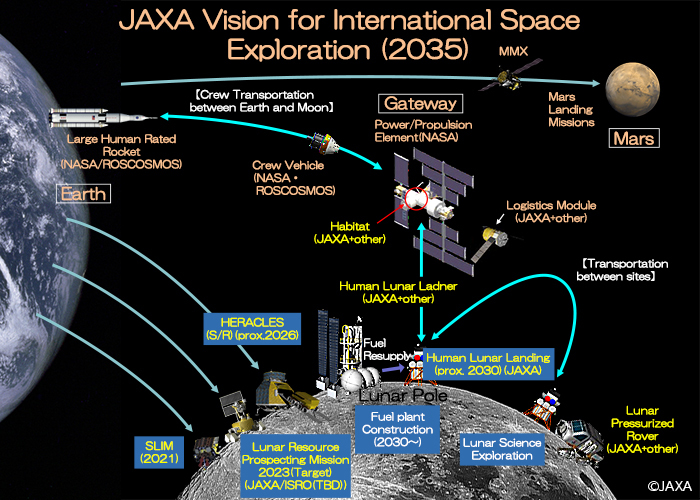 Space agencies, including JAXA as the key member, are now coordinating plans for internationally collaborative space exploration targeting the Moon and Mars. In addition, several of Japan's own exploration missions are also being studied. Acquiring the advanced key technologies for these space exploration missions contributes to expanding humankind activity in space as a scientific and technological power house, and to securing Japan’s position in the international space exploration program. This acquisition will result in securing the rights for utilizing resources at the Moon and Mars. It will also make it possible to continuously deliver the top scientific achievements to society. In order to research such technologies effectively with limited resources in terms of personnel and funding, we are strategically planning and conducting the research by investigating the cutting-edge technologies of other countries and the coordination of international space exploration, and by cooperating with national research institutes and the laboratories of private companies. The ISS/International Space Exploration Sub-Committee published a "Second Report of "International Space Station & International Space Exploration Subcommittee"". The report states that the most important next steps are to acquire the technologies for landing on a gravitational body and to explore the south pole of the Moon, and also identifies the four areas to be primarily advanced: (1) Technologies for landing /takeoff on/from a gravitational body, (2) Technologies for exploration of a gravitational body (energy, traverse, and handling), (3) Technologies for habitation, and (4) Technologies for logistics in deep space, such as rendezvous technologies.